​Unlike most websites about the island of Oahu, oahupictures.org is intended to provide Oahu residents and others familiar with the island with visual depictions of everyday landscapes and scenes, mostly from aerial vantage points. In contrast to many sites about Oahu posted for tourists, the site is intended to be documentary and assumes familiarity with the island. The site shows aerial videos and photos, including links to 360° photos, that I have taken while pursuing a non-commercial hobby. As an amateur photographer and quadcopter (drone) pilot who has lived on Oahu for 43 years, I am adding to the site regularly and expect it to be under development for many months. Most of the videos were taken flying along beaches, filmed in a manner unlikely to disturb or offend anyone. I took most of the 360° photos in public parks or on school grounds on weekends. As no doubt is apparent to the trained eye, I am learning video editing as I proceed. 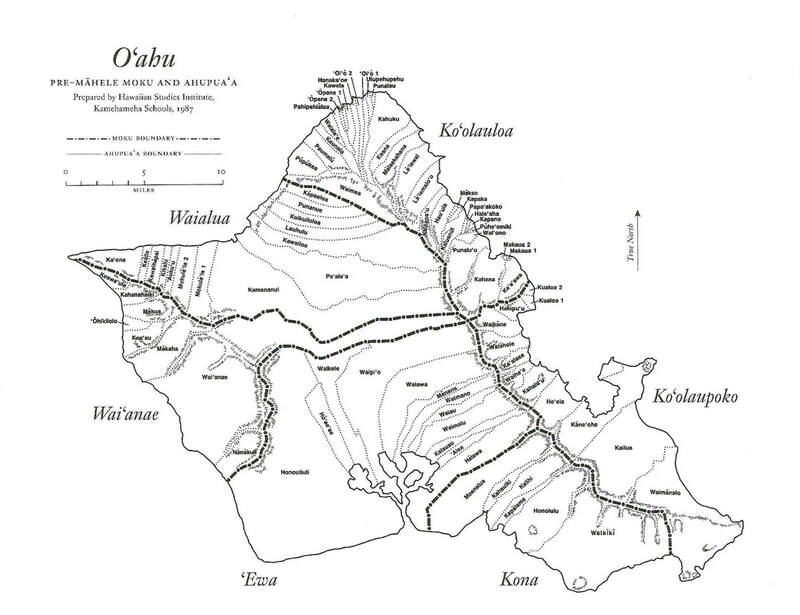 I have categorized the pages by the pre-mahele ahupuaa shown on a map (below) by Kamehameha Schools. I have had to estimate the locations of some ahupuaa boundaries, relying heavily on the boundary signs placed in recent years along streets and roads. Some place names are from Google Maps or U.S. Department of the Interior Geological Survey topographical maps. FAA rules do not allow filming within five miles of major airports without airport permission, which eliminates posting videos and aerial 360s of the south shore west of Magic Island and up the Waianae Coast to Kahe. Flying quadcopters on the windward side usually is permitted within five miles of Marine Corps Base Hawaii on Sundays and on federal holidays. To view the 360s, scroll or swipe left/right and up/down. Zoom in and out, as well. Although my preference is otherwise, I give Hawaiian place names without diacritical marks so as to facilitate viewers' searches of the site. Thanks to S.B. Brandon and R. Gardner for accompanying me on filming excursions and for regular careful editing and feedback.